There is something of a question surrounding this piece–whether it is a vase, the base to the Stork and Rushes punch set, or both. 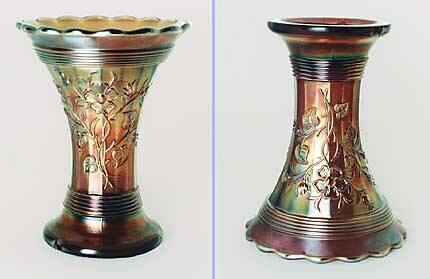 As a vase (left), the base seems rather wide; as a punch set base, the flowers are upside down. Yet, all the punch sets I've seen or heard of had this base. An amethyst vase sold in 2010 for $200; marigold vases for $55 in 2007 and $8 in 2011.